Despite having a rough summer, with a number of factors pushing gold below $1,200 an ounce (the high dollar, US economic growth, interest rate hikes, booming stock markets), the precious metal appears to be back in favor, with December gold futures closing Tuesday’s trading at $1,207 an ounce - a two-week high. In 10 minutes, Bloomberg reported, December gold contracts equal to 1.57 million ounces changed hands on the Comex in New York - almost 12 times the 100-day average volume at that time of day. The catalyst was fresh safe-haven demand owing to political uncertainty in Italy. A government official reportedly said Italy would be better off with its own currency, adding to doubts about the country’s fiscal situation. The EU has to pass Italy’s budget and many think it won’t cut the mustard. “An IMF Financial Statistics Report reveals that Egypt recently bought gold for the first time since 1978, and that India, Indonesia, Thailand and the Philippines have re-entered the gold market after years-long absences. And Bloomberg reported that the Bank of Mongolia has purchased 12.2 tonnes of gold so far this year. 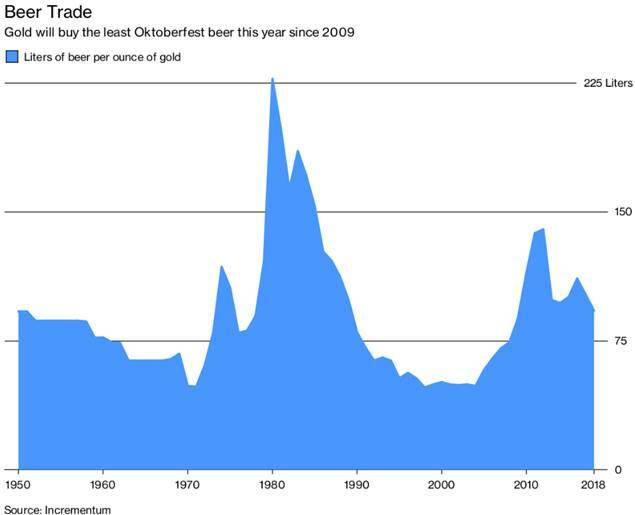 The chart below is probably the number one reason for gold’s poor performance; the US dollar has climbed steadily since April, mostly due to continued buying of US Treasuries - not because other countries are especially confident of the US economy right now (in fact the opposite is true, with the Trump Administration engaged in a protracted trade war with China) - but because there are no other alternatives. The gold price chart above is practically a mirror image of the dollar. Read our Gold and the great stage of fools to learn why the dollar is so strong, at the expense of gold, and The beginning of the end of the dollar, about why the dollar no longer enjoys “exorbitant privilege”. Toronto-based Barrick announced it would purchase Randgold for a spectacular $6 billion - putting Barrick on top of the gold producer heap just as it was about to be shoved off by US-based Newmont Mining. The all-share deal means Barrick shareholders own two-thirds of the company and Randgold the rest. The merger follows earlier M&A in the gold space this year, including the acquisition of Nevada-based producer Rye Patch Gold for $128 million, US silver miner Hecla Mining acquiring Klondex Mines, which has three underground gold mines in Nevada, and the swallowing up of Victoria Gold and its Eagle gold project in the Yukon by Osisko Royalties - which has a 5% royalty on the largest gold mine in Canada, Canadian Malarctic. Gold companies are just now starting to replenish their deposits through acquisitions. A Thomson Reuters report said 2016 was the first year since 2008 that gold mine output actually fell - by 22 tonnes or 3%. As for new gold mines, the bear market of 2012 to 2016 meant most large gold companies slashed exploration budgets and small explorers had an extremely tough time raising cash. All of the low-hanging fruit - easy-to-mine gold deposits - have been picked, and what is left is usually remote, deep underground, and expensive to extract. 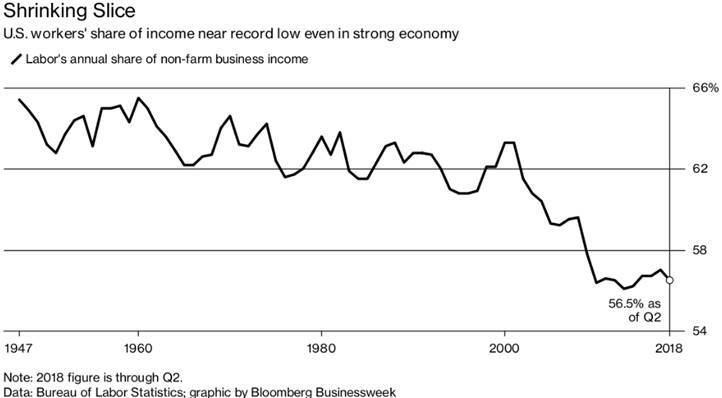 The big gold miners made some dumb moves at the top of the mining cycle, spending like drunken sailors on over-priced mines, putting themselves into debt and causing mine writedowns, then failing to buy cheap assets when the gold price tumbled in 2013 because they were tapped out. The most infamous of these was Barrick’s absurd purchase in 2011 of Equinox Minerals. Hoping to diversify into copper, Barrick paid $7.3 billion for Equinox and its Lumwana copper mine in Zambia, only to write down $4.2 billion two years later. But it wasn’t only Barrick creating shareholder value destruction – the sector incurred $85 billion of write-offs from 2010 to early 2017. 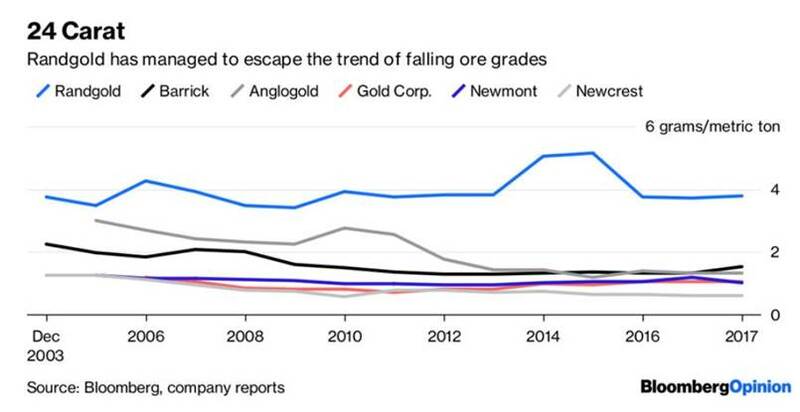 However Randgold has largely been spared the curse of falling grades, mining at over 4 g/t compared to the other four top majors - Barrick, Anglogold, Newcrest and Newmont - who are at 2 grams a tonne and below. 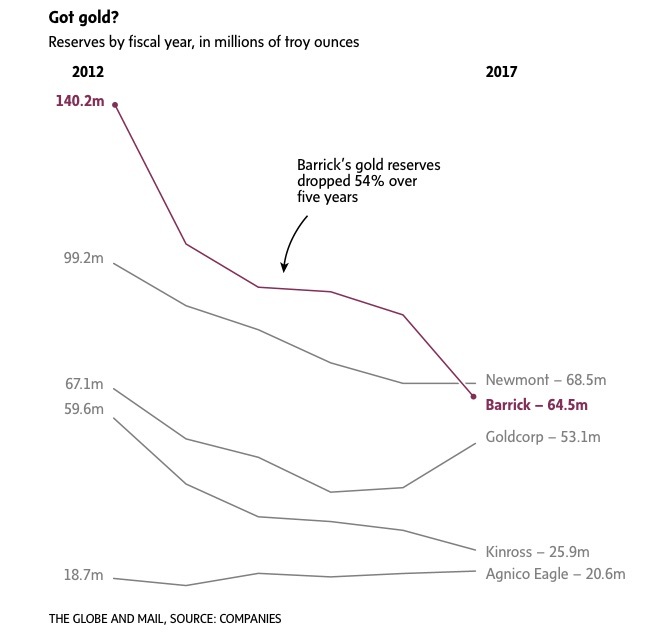 This shows that Barrick needs Randgold more than the other way round. 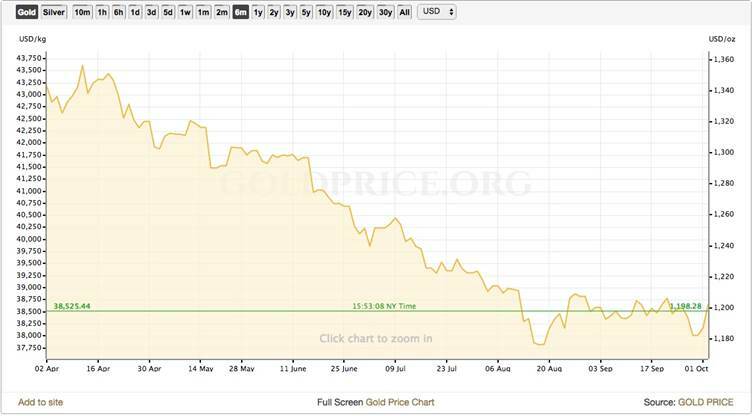 Looking forward, experts at the recent Denver Gold Forum seemed to agree that the bottom for gold has been reached and that it’s time for a rebalancing. Ken Hoffman, senior expert at McKinsey Basic Material Practice, told Kitco News that a rising US deficit, coupled with more money printing (another QE?) will heat up the gold price. That deficit, by the way, is heading toward $985 billion in fiscal 2019. In other words, the US government spent 4.407 trillion but only took in revenues of 3.422 trillion. It’s 18% more than last year. Gold is also rallying because other commodities are rising, namely oil, which closed at $85.90 on Wednesday (Brent crude). This increases the threat of inflation, which is a catalyst for gold. Right now gold is the cheapest it’s been compared to oil, in four years. It’s all positive for the gold market. Mergers and acquisitions are heating up as gold companies position themselves to take advantage of undervalued companies and assets. Of these there are dozens of juniors out there with excellent properties ripe for the picking. The US dollar is still a headwind for gold, but the dollar can’t stay strong forever. As we’ve written, we are witnessing what is likely the beginning of the end of the dollar. The US is unlikely to win a trade war with China, and in fact, is only making China more independent of the US, and encouraging other countries in its orbit, including Russia, to trade in rubles and Chinese yuan. Interest rate hikes are probably baked into the price of gold. We no longer see big swings every time the Fed threatens to raise rates. 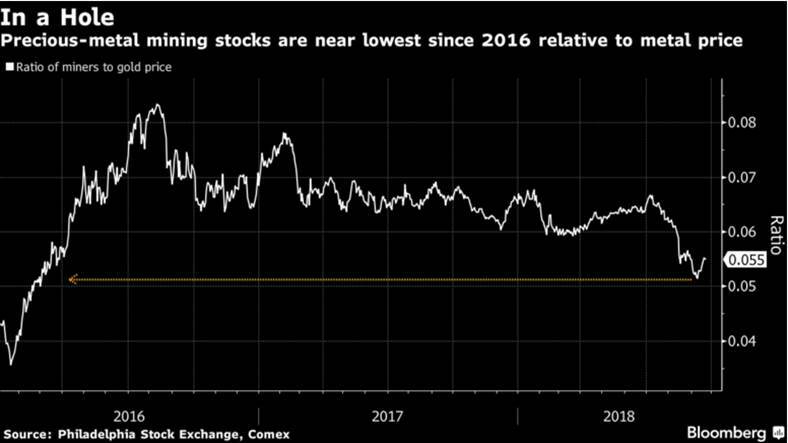 The hot spots around the world aren’t cooling down any, opening the door to investors who want to own gold to calm their fears of plummeting currencies.